Samsill Corporation announces that it has earned multiple Awards of Recognition in the 2012 Product of Excellence Awards presented by the Binding Industries Association. “Our Speedy Spine binder continues to be recognized by industry peers as a game changer”, said Samsill Executive Vice President of Sales and Marketing Bob Schultz. 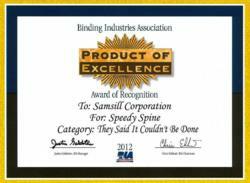 Samsill Corporation, one of the world’s largest independently owned manufacturers of ring binders, sheet protectors, business accessories and laptop cases, today announces that it has earned multiple Awards of Recognition in the 2012 Product of Excellence Awards presented by the Binding Industries Association. For more than 30 years, the Product of Excellence Awards have recognized outstanding examples of craftsmanship in binding, graphic finishing, information packaging, and custom loose-leaf manufacturing. Samsill placed second in both the “Product Design” and “They said it Couldn’t Be Done” categories with its revolutionary Speedy Spine view binder. The Speedy Spine Three-Ring Binder includes a Patent Pending spine channel for the fastest and easiest spine label insertion. Testing has shown it to be 5X faster than traditional view binders. Samsill Corporation is one of the world’s largest privately held manufacturers of ring binders, sheet protectors, business accessories and laptop cases. With corporate headquarters in Fort Worth, Texas and manufacturing facilities in Texas, Mexico and China, Samsill has grown over the past 58 years from a small family business to an employee-owned international corporation serving the school, home and office markets. For more information about Samsill and its full line of products visit http://www.samsill.com.